This article originally appeared in Beyond Belief #11 back in June 1997. R.I.P Possum! It’s not often in life that one gets a second chance at making amends for a less-than successful attempt at a once-in-a-lifetime opportunity. Not unless of course you are Elvis Costello. In 1983, a possible combination of stage fright and a tired throat, made for a rather awkward appearance with Tony Bennett on an almost forgotten television program. However, EC would later fare much better in his 1994 guest slot on Tony’s acclaimed Unplugged show. Well on February 5th, EC got another second chance, this time with his idol George Jones. Although a hit by musical standards, their first endeavor in a 1981 HBO special was hampered by EC’s bought with the mumps. The setting was the famed Ryman Auditorium, the site of the Attractions’ 1996 US tour debut, for a taping of Ricky Skaggs Monday Night Concerts for The Nashville Network. There would be two tapings that night. Jones and Costello would be Ricky’s guest for the first and Brian Setzer and Marty Stuart would be guests for the latter. Tickets were distributed free by a radio station and as was said to be the case with previous tapings, no one was turned away at the door. The Ryman was only about 95% full although it emptied out considerably as the Setzer/Stuart show ran late into the next morning. Right about 7:30, Skaggs took the stage backed by a six-piece band (pedal steel, drums, guitar, bass, keyboards and a fiddle/mandolin player) and started into the Jones’s classic “One Woman Man”. After a chorus or two, out strolled ‘ol “No-Show” Jones from stage right taking over lead vocals carrying a hand-held mike. I guess it shouldn’t have been a surprise but it was when soon after Elvis did the same thing from stage left. The three concluded the song together and were then treated to a thunderous applause, one that grew even louder when “Mr. Clean”, the bald-headed man-in-charge told them to do another take. The second take however only got as far as Costello’s walk-on when he stopped cold when he seemed to be having trouble hearing himself on the monitors. a third and final take then followed and the show opener was in the can. The stage was then given to EC and George for a go at “Stranger in the House”, the Jones-destined number that they recorded together for Jones’ My Very Special Guests LP in 1978 that I suspect George has not sung since the 1981 TV special. With EC on acoustic guitar, George butchered the first take but ran through it any ways commenting “I haven’t sung this since 1978…it might take a couple of more takes”, to which Elvis added “Can you stand that?”. EC then gave George some off-mike coaching on the melody (words were not a problem as there were teleprompters in use) and the Ryman acoustics made this lesson a classic moment in Costello history. After the lesson George replied” I think the boy knows what’s going on” and a second take went much better with Jones blowing only the last verse which they went ahead and redone. Next after some makeup work came the true highlight of the show when the three stars sat on the edge of the stage, Jones flanked by EC and Ricky with acoustic guitars. What went down here was what seemed to be an unintended transformation of the show into a George Jones tribute of sorts. Ricky went first getting George to sing his faves “Window Up Above” and “The Grand Tour”. Then EC got his turn, first telling us the story of how after the 1981 TV special they went back to George’s trailer on the set. There they told him of the plans to record three of his songs for Almost Blue and were treated to George singing a bit of each of them so they’d get them right. This lead to them singing a bit of “Good Year for the Roses” together with EC making note of it being a top-10 hit in the UK. Still “sitting and a picking”, Elvis got to pick out and sing his fave George Jones’ songs (“one’s he won’t remember”), “The Last Town I Painted” and the “The Big Fool of the Year”. George was stunned to say the least saying “I can’t believe he remembers them all…that boy must have a computer chip in his head”! The three then concluded this portion of the show singing together on “Why, Baby, Why”. It was now time for George to film his segment of the show which started with he and Skaggs singing Ricky’s choice of one of his Jones’ favorites, “The Selfishness In Man”, written by Leon Payne (also writer of “Psycho”) who Skaggs mentioned was blind. Two additional guitarists and a female singer then joined in for in Skaggs’ opinion, “the greatest country song”, George’s classic “He Stopped Loving Her Today”. It took four takes to finally get this one right insofar as fitting the backing vocal in just right and as George was simply a little sloppy at first. Commenting that he hadn’t sung in awhile, the final take of this number was perfect and downright beautiful. 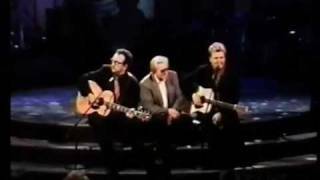 With the extra guitar power staying on stage and Skaggs and Costello on their acoustics, the show-closer, a rave-up of George’s “White Lightning” was next. Ricky and Elvis sang in duet-style with Jones’ taking on the baritone chorus. We were the told not to go away as Elvis was going to record his set next. EC and Ricky came out together and chatted about how they discovered music in reverse (Elvis: the Beatles back to R&B and country to the Everleys then the Louvins). They then gave us a great version of a song co-written by George Jones and made famous by Gram Parsons and Emmylou Harris on the GP album “That’s All It Took”. After hearing two flawless takes of this number, Elvis then nailed a version of “Indoor Fireworks”, still on acoustic backed by the full house band. (Perhaps he is still trying to convince Skaggs to record the number. He remarked at the Ryman in August 1996 that Skaggs turned down the songs perhaps because “cowboys don’t drink martinis”). We were told that he had also earlier rehearsed “Our Little Angel”. Things were to then have ended and walking to the door, no sooner had our little group selected “That’s All It Took” as the best song of the night, we were called back to hear it again as result of a camera problem. The two-hour plus taping was now complete and we then made way to the stage door to congratulate EC and were un-believers when we were told that “Elvis had not left the building” and was playing in the next taping. Being cold and late we left only to hear that EC did stick around and joined Skaggs, Setzer and Stuart for a late night rave-up of “Sittin’ and Thinkin” and Honey Don’t. Fantastic recap of a night I will never forget. 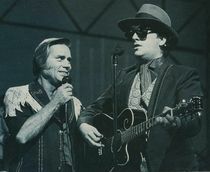 I’ve long told friends about the night I saw Elvis Costello sing with George Jones at the Ryman. With so many retakes that it almost sucked the fun out of seeing them together. Almost. It was still a helluva great evening. Your recap filled in the gaps my memory of my only trip to Nashville when I was 22 years old. The Setzer/Marty Stuart follow up taping was great too. What a long night.